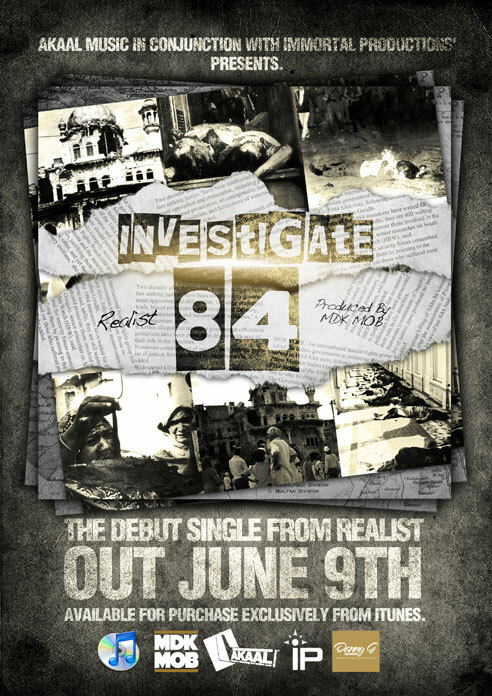 ‘Investigate 84’ the rap single from human rights activist rapper REALIST feat. Pavitar Singh Pasla and underground producers the MDK MOB is the first release from Akaal Music and it is released in conjunction with the well respected and established record label Immortal Productions. REALIST drops hard hitting lyrics aimed at the Indian Government demanding an independent investigation into the Sikh Genocide which was carried out in India in 1984. Tens of thousands of innocent men, women and children were murdered, tortured and raped during the genocide 27 years ago and still not a single arrest has been made against the criminals that carried out such gruesome crimes against humanity. The single ‘Investigate 84’ is the start of a movement which sole purpose is to raise awareness of the atrocities, which took place against the Sikh people in 1984 and to pursue justice for the victims of the Sikh Genocide. The movement will continue to make noise in the media until the goal is achieved. ‘Investigate 84’ is out on June 9th exclusively on iTunes, all proceeds raised from the single will go back into the seva of running these projects. Contributions made by all artists are done solely on a Seva (selfless service) basis. This project is purely non-profit in which no money is made by any of the project contributors. All proceeds go back into Seva and to maintain the future longevity of these & other projects. We urge you to offer your support by purchasing only legitimate and legal copies of the single. Latest Punjabi Songs, Latest Punjabi Music, Download Free Songs, Free Songs Download, Punjabi Music, Punjabi Songs, Punjabi Music Website,Punjabi Music Blog.